A loud and raucous capacity crowd in Nashville got its first look at the elite talents of the NWHL on Saturday at the All-Star Skills Challenge, while nearly half a million viewers tuned in on Twitter. While Team Szabados defeated Team Stecklein in the overall competition, 4-3, after a tiebreaker, that was secondary to the extraordinary display of skill by all of the NWHL players before the sold-out audience of rabid hockey fans at Ford Ice Center. The most anticipated moment in a night filled with highlights was the return of Kendall Coyne Schofield of the Minnesota Whitecaps and US National Team to a Fastest Skater competition after her history-making performance two weeks ago at NHL All-Star Weekend. Coyne Schofield was matched up in her race against Whitecaps teammate Allie Thunstrom, who besides being an all-star hockey player is a competitive speed skater. The matchup did not disappoint as Coyne Schofield won in a blazing 13.9 seconds while the fans roared their approval for both competitors. After a season in Europe, Blake Bolden returned to the NWHL Skills Challenge looking to win the Hardest Shot competition after being victorious in the event in Pittsburgh two years ago. Bolden, who earlier in the day moved an audience of young girls with her inspirational thoughts at the NWHL Play Like a Girl Summit, unleashed her slap shot at 80 mph to reclaim her title. The Trick Shot event showed off the awesome skill and creativity of a half-dozen of the NWHL’s best, with Team Szabados winning the event as chosen by the fans in the arena. Team Szabados broke out the Flying V, made famous by The Mighty Ducks movie franchise, for one of their attempts. Emily Fluke of Team Stecklein wore a cowboy hat for her attempt, scoring after throwing the hat at Shannon Szabados in net. “It was electric out there,” said Team Stecklein forward Dani Cameranesi. “It was so cool seeing it sold out and seeing all the fans and getting a little interaction to vote on who had the best shootout moves. I personally think Team Stecklein did, but it was a lot of fun and it was really loud out there. In other events, Beauts goaltender, Nicole Hensley, competing against her Beauts goalie partner Szabados, won the Fastest Goalie competition. Fellow Beaut Cameranesi was the victor in the Accuracy Shooting contest, finishing in just over 12 seconds. All in all, it was an incredible day of hockey at Ford Ice. 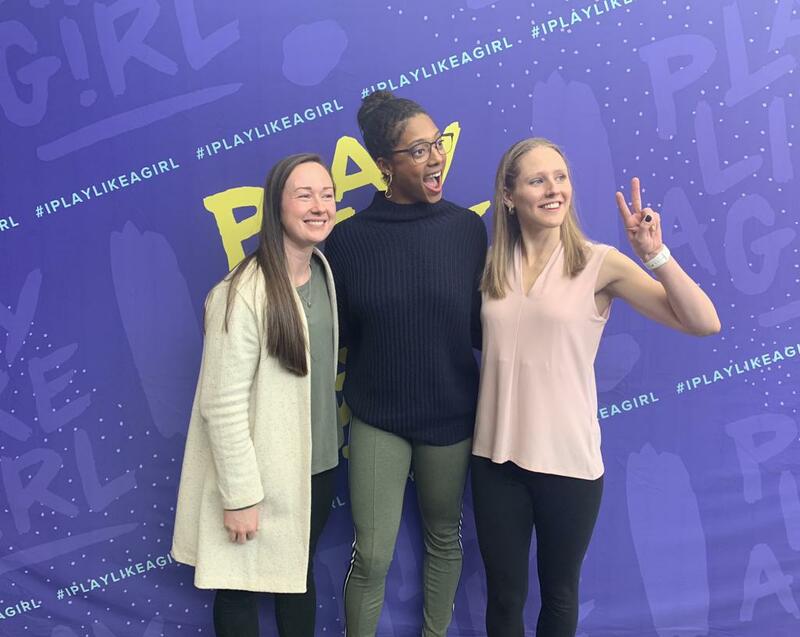 It started with the Play Like A Girl Summit, which besides Bolden featured all-stars Stecklein, Alyssa Gagliardi and Shannon Doyle, as well as Commissioner Dani Rylan and Deputy Commissioner Hayley Moore. The NWHLers provided the audience a lot of advice and motivational thoughts for young girls and their parents. Prior to the Skills Challenge, the all-stars led more than 50 hockey players from the Middle Tennessee region in the annual NWHL Youth Clinic. When the Skills Challenge was over, Bolden, Moore and broadcaster Erica Ayala participated in a meet-and-greet with the Black Girl Hockey Club. And to cap the day off, all of the fans at Ford Ice lined up for photos and autographs from the NWHL stars. Nashville has warmly embraced NWHL All-Star Weekend. When the players arrived at the airport on Friday, they were greeted with signs all over and outside the venue. On Friday night, the Nashville Sports Council and city tourism bureau hosted the league and players at a welcome reception at Bridgestone Arena. That will be on Sunday, when the 2019 NWHL All-Star Game takes place at 2:30 p.m. CT at Bridgestone Arena and broadcast live on Twitter. Tickets are also available at NWHL.zone/tickets.